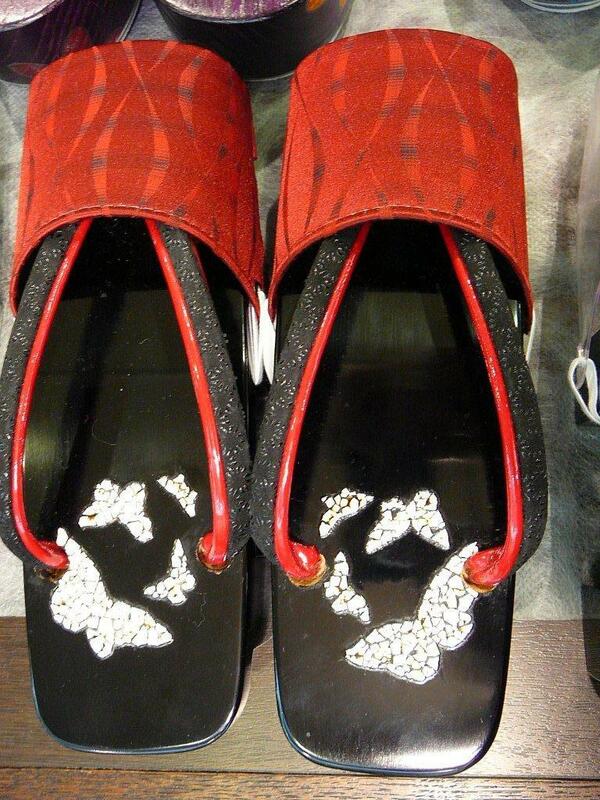 Mizutori Geta/Japanese Traditional Clogs/Sandals in Shizuoka City! At last I had the opportunity to visit and witness the power of a Japanese lady in Shizuoka Prefecture! Yukiko Mizutori had not thought of succeeding her father, Masashi Mizutori, the 3rd generation owner of Mizutori Company founded in 1937 in Shizuoka City and instead opted to become a beautician 10 years ago. 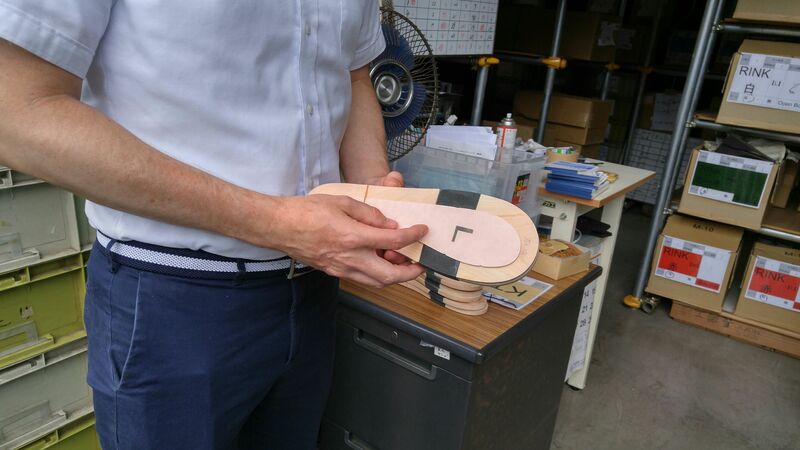 Jonathan holding the main sole (“dai”) of a geta in its original form cut out of high quality hinoki/Japanese cypress. But 4 years ago, having worked away from home for 7 years and getting married to Jonathan Barnabe from Quebec, she had to take a dudden turnin her life when her father, due to declining health, became increasingly worried about his business. 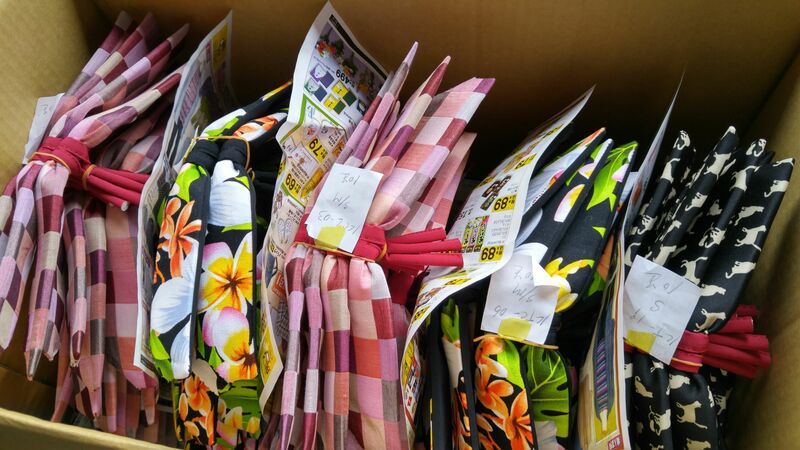 Beautiful range of sandal straps (“hanao”) from which customers can choose. Having no sons, but three daughters, Yukiko being the second one, it would have been nigh impossible to find a suitable successor when she decided to ask her father to let her take care of Mizutori Company. He accepted and now only participates as a an overseer and exhibition manager. On the other hand Yukiko had to study very hard and fast to succeed him. 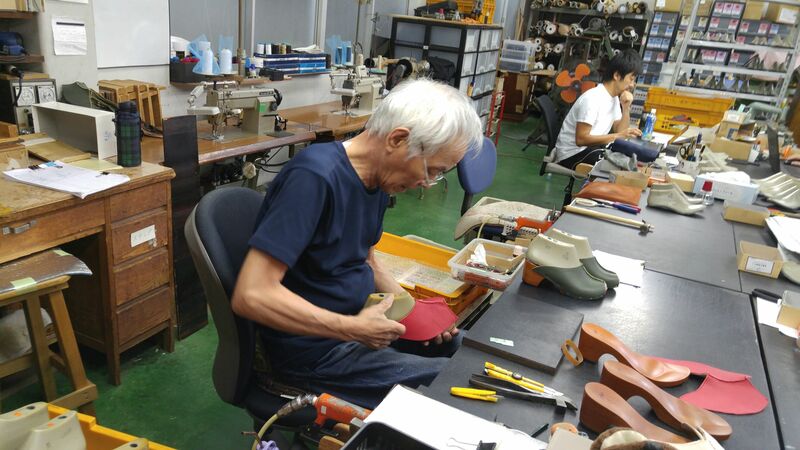 Lady staff working on the sole of a geta. First, as a lady she would be free to implement new ideas and thinking into the craft. Second, her husband is a former engineer nad now that he has acquired sufficient abilty in the Japanese language he can contribute much needed unique ideas to develop the business. Third, instead of thinking solely of competition, she knew that collaboration would be far more beneficial and outsourced the making of geta with more than 12 local companies to provide design ideas, materials and work togeteher for combined products. Fourth, and maybe more importantly, she uses, as much as possible, Japanese material form nearbymountains and forests. When she needs exoctic wood her husband travel to Vietnam, Indonesia and other countries where his foreign language ability comes in handy. Making geta/sandals involved many materials which have to be stored permanently! Her company presently counts 15 staff and all participate, young and not so young, to the whole concpet of the company, even modelling for their pamhlets and brochures! 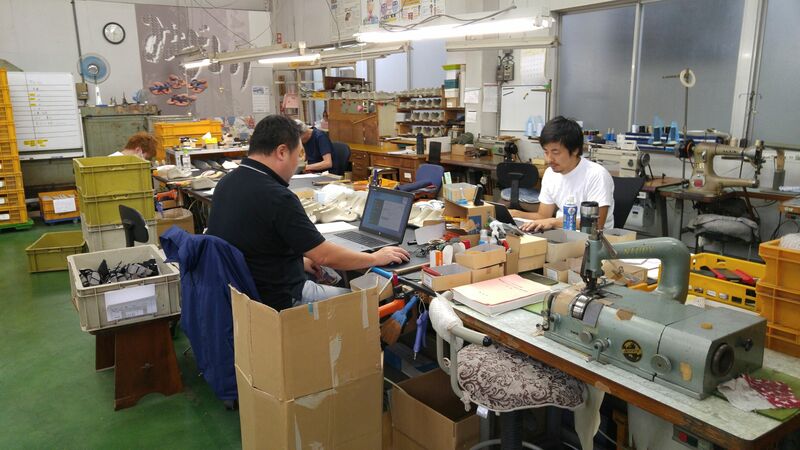 Not only her company supports local workers by using made-in-Shizuoka products whenever possible but also by hiring residents in the neighborhood. 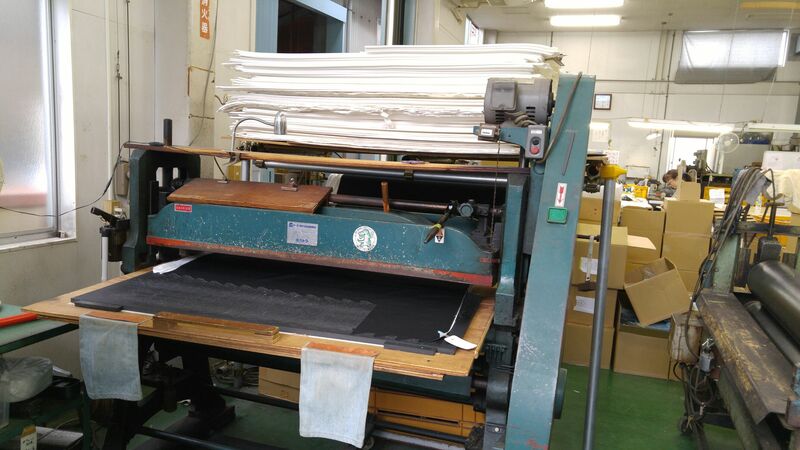 Some work is done with traditional machiney. But highly specialsed craft needs the hands and skills of veterans! But young power is also definitely needed! Without mentioning the need for a professional office team! And orders are piling up! Prices for Mizutori’s geta range from ¥6,800 to ¥18,000, but those painted with urushi lacquer cost as much as ¥200,000, and the award-winning made-to-order product requires two months until delivery. Geta can be made with flat soles in a modern style but also with two ha/stilts for more tradiyonal footwear. Geta may look unwieldy at first to a Westerner, but the fit and breathability are such that they are as easy to wear as a rubber beach sandal. 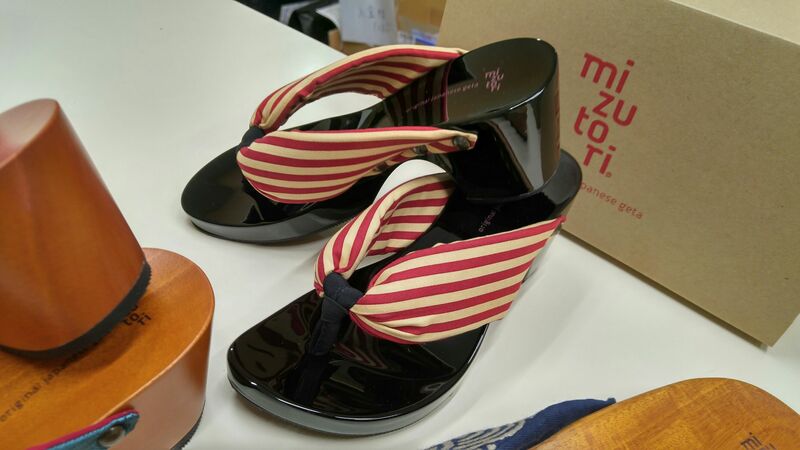 Mizutori Company provides sandals up to 32 size! 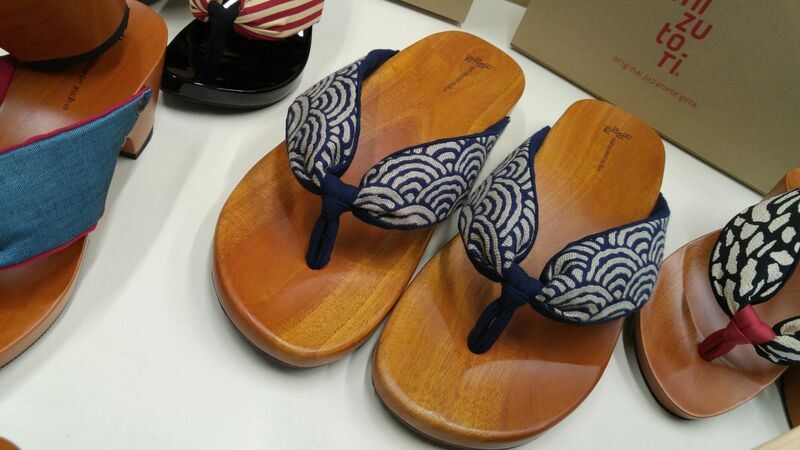 Geta are designed both for ladies and gentlemen and of course for children. 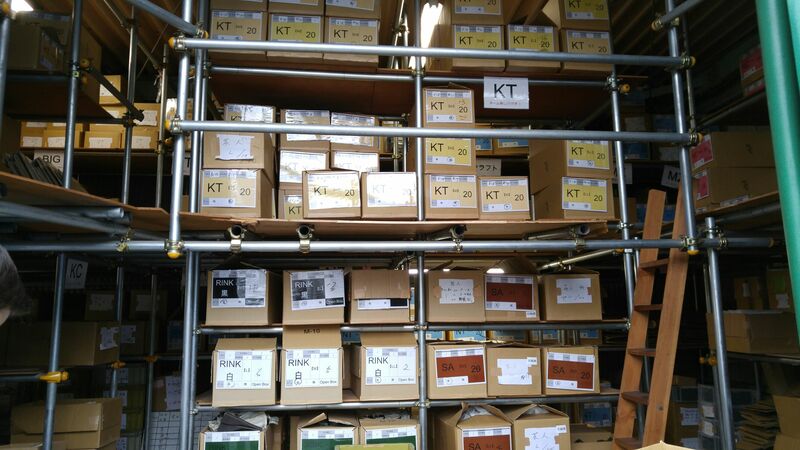 As for ladies’ footwear height can be designed according to the customer’s priorities and preferences! 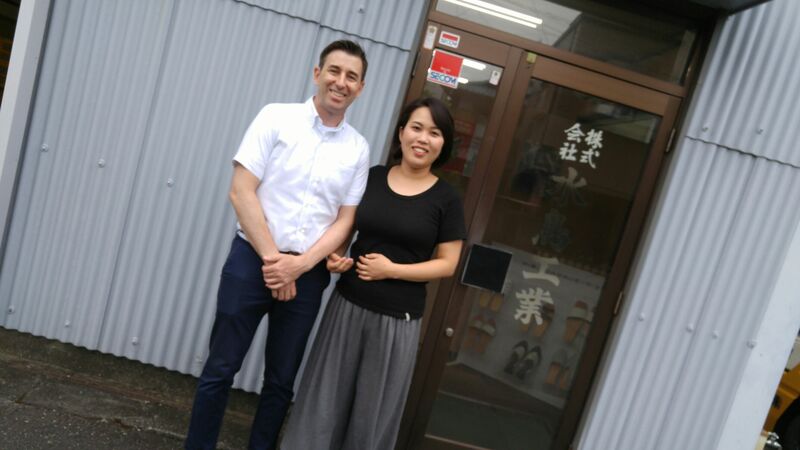 The great news is that Mizutori Company is planning to accept and design visits for foreign visitors who will be able to make their own sandals on site! They would certainly make for a great and unique souvenir gift back home! The other good news are that Mizutori Company will soon open an otlet shop in the middle of Shizuoka City, on Aoba Street (Aoi Ward) in the middle of the of an area replet with great shops, izakayas and restaurants. But this is for another article! Not so long ago, the sound of wooden clogs (geta/下駄 in Japanese) could still be heard at any time of the day and night in any season in cities as well as in the countryside. This is still mentioned as one of the sounds that older Japanese miss most in modern life. 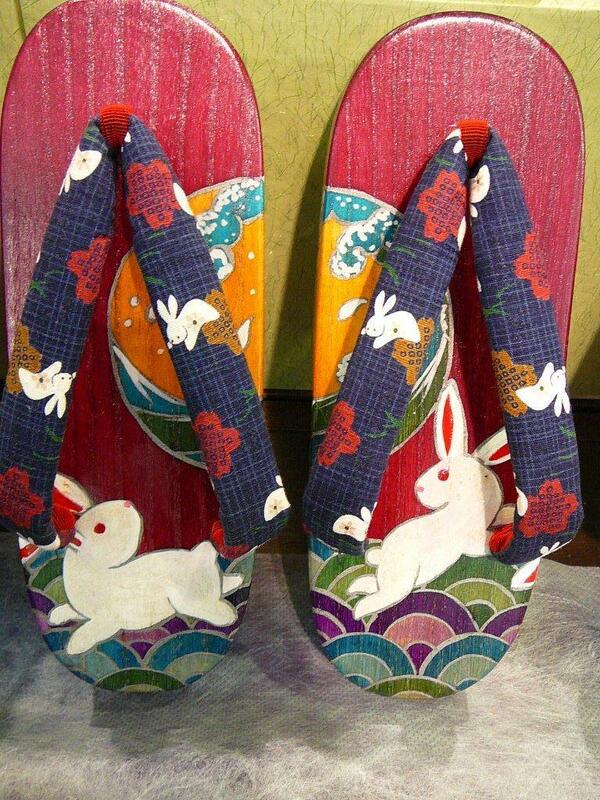 A traditional saying in Japanese says that “You do not know until you have worn geta.” meaning that you cannot tell the results until the game is over. Chefs were wearing them at work inside izakayas and sushi restaurants. Now they wear graceless white vinyl boots. Interestingly enough, by ignoring geta in favor of Western footwear, the Japanese are not doing a favour to their own health. Instead of being constricted inside shoes with the consequent skin problems during the rainy season and sweaty socks to wear with them, geta allow free movement of the feet in the most natural environment. Contrary to belief, walking with the skin in direct contact with a wooden or lacquered surface does keep the feet at a comfortable temperature, even in the snow. 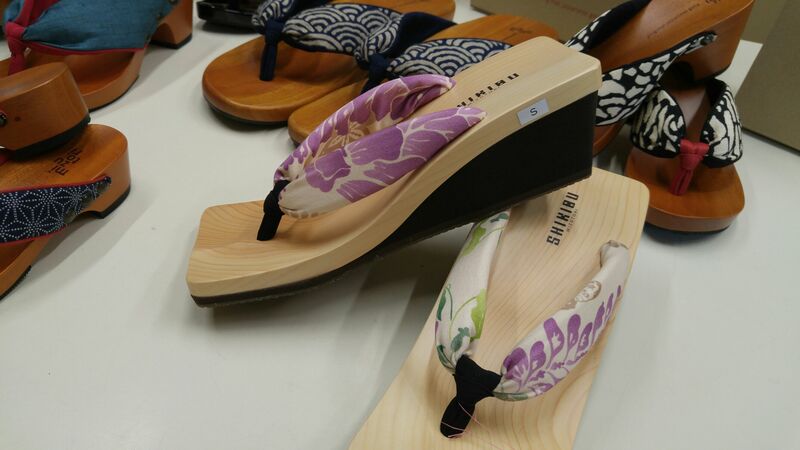 Moreover, good Japanese-made geta cost an average of 5~6,000 yen (50~60 US dollars), which make them cheaper and far more durable than Western shoes! They can be easily worn day in day out for up to 10 years according to traditional makers in Shizuoka Prefecture! 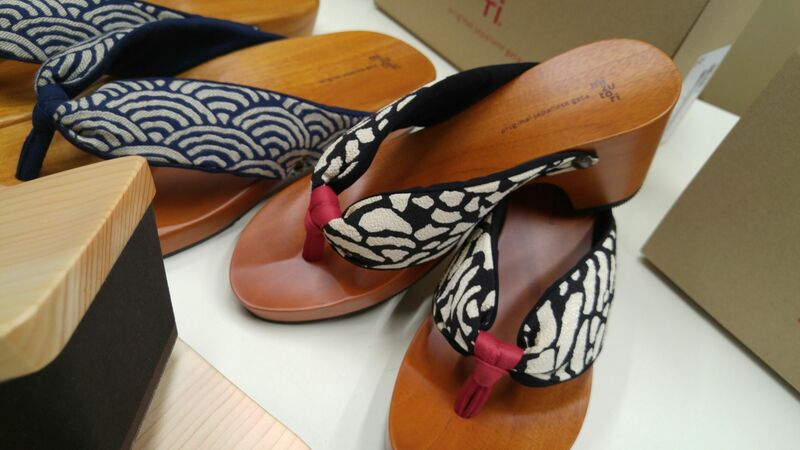 The great majority of modern geta are made abroad, especially in China these days but traditional manufacture still survives in Japan. The City of Fukuyama in Hiroshima Prefecture produces 60% of the national output. Hida City in Oita Prefecture is also a major producer. 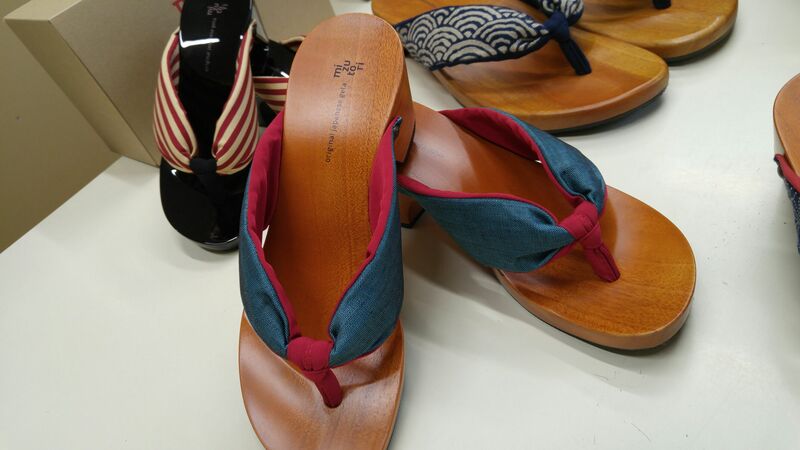 Traditional and high quality geta are especially made in Fukushima, Nagano, Niigata, Akita and Shizuoka Prefectures. Geta are sometimes called wooden clogs in English because of their resemblance wit clogs and flip-flops. One could describe them as a kind of elevated wooden base held onto the foot with a fabric thong to keep well above the ground. They are worn with traditional Japanese clothing such as kimono or yukata but (in Japan) also with Western clothing during the summer months. One can still see people wearing them in rain or snow to keep the feet dry, dur to their extra height and impermeability compared to other shoes such as zori. 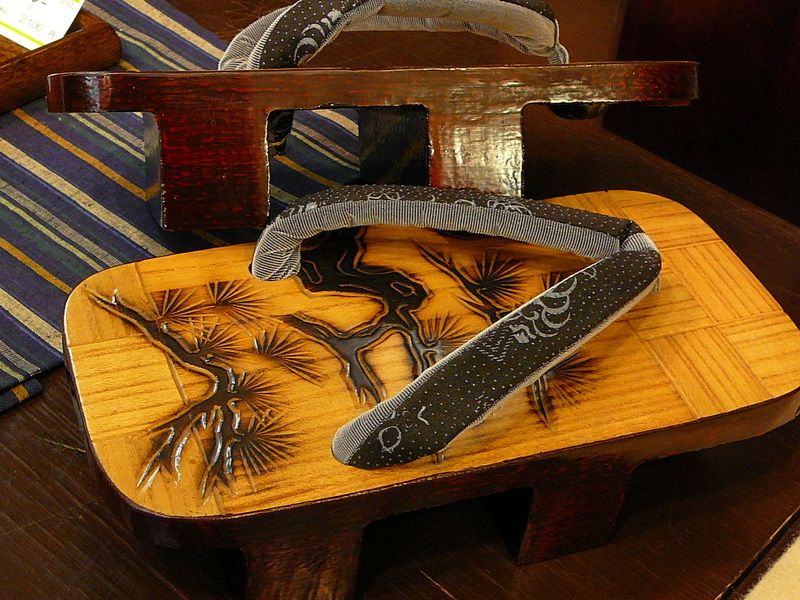 There are several styles of geta. The most familiar style in the West consists of unfinished wooden board called a dai (台, stand) that the the foot is set upon, with a cloth thong (鼻緒, hanao) that passes between the big toe and second toe. Although there is no need to wear socks, apprentice geisha (also called “maiko”) wear their special geta with tabi (Japanese socks) to accommodate the hanao. Ladies will often add a protective cap called tsumakawa (爪掛) to protect their toes from the rain or mud in inclement weather. The supporting pieces below the base board, called teeth (歯, ha), are also made of wood. Cheap clogs are made with cedar wood (杉, sugi), whereas high-quality geta are made of very light-weight paulownia (桐, kiri) imported from Northern Japan. The teeth are usually made separately and fixed to the base board later (Funageta/船下駄), whereas more valuable geta will be carved out of a single block called (Okaku/大角). 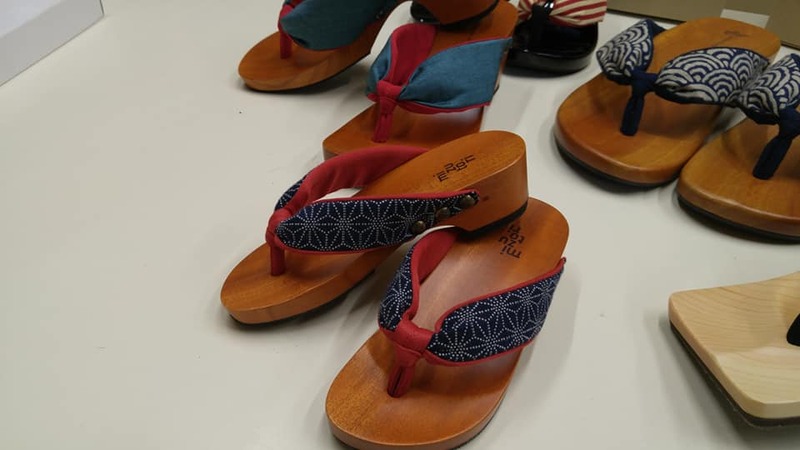 Although great craftsmen are becoming scarce (there are only five recognized in Shizuoka Prefecture in spite of their fame), geta can and usually are suggested to be made on order, so as to perfectly “fit the feet” of its wearer. Such footwear is becoming increasingly popular abroad where more and more people have recognized not only their practical, health and ecological values, but also for their decorative and fashion merits. The dai may vary in shape: oval and narow for ladies to rectangular and wide for men as well as in color: natural (harigeta/張下駄), lacquered (nurigeta/塗り下駄) or stained. The teeth of any geta may have harder wood drilled into the bottom to avoid splitting, and the soles of modern clogs of the teeth may have rubber soles glued to them. The hanao can be wide and padded, or narrow and hard, and it can be made with many fabrics Printed cotton with traditional Japanese motifs is popular. Inside the hanao is a cord (recently synthetic, but traditionally hemp) which is knotted in a special way to the three holes of the dai. 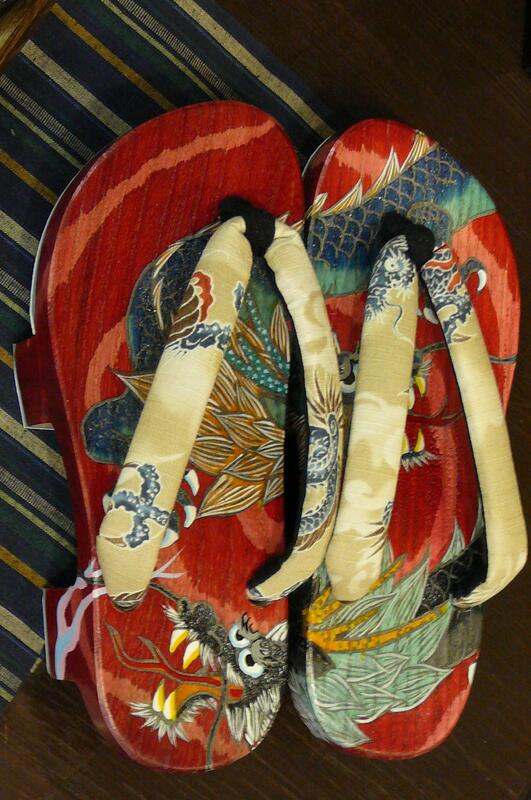 The hanao are replaceable, although breaking the thong of one’s geta is considered very unlucky! Maiko in Kyoto wear distinctive tall geta called okobo. Also very young girls wear “okobo”, also called “pokkuri” and “koppori”, that have a small bell inside a cavity in the thick “sole”/dai. These geta have no teeth but are formed of one piece of wood. They are carved in such a way as to accommodate for walking. Japanese professional sumo wrestlers in the lowest wo divisions of Jonokuchi and Jonidan must wear geat with their yukata at all times! 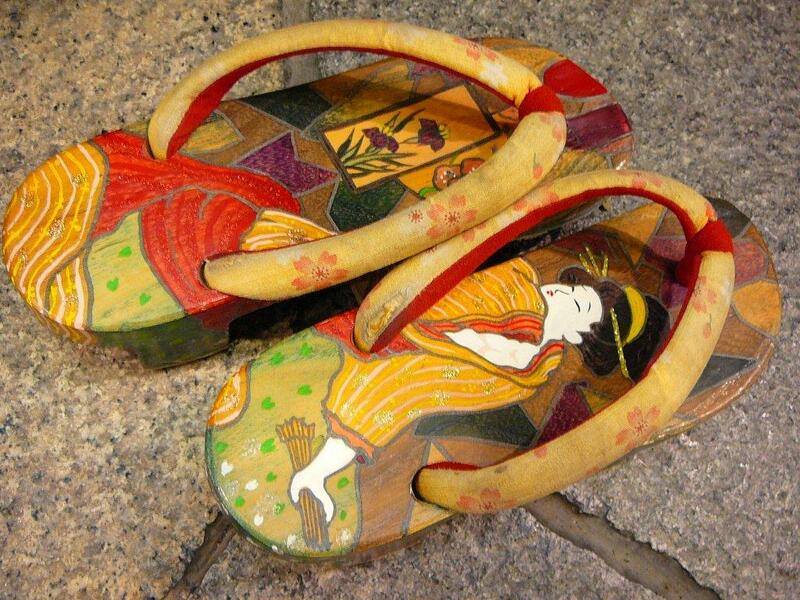 -Yama Geta/山下駄: Square mountain Clogs made of paulownia wood and worn at the beginning of Edo Era. When made with cedar pine wood, they are called Yoshiwara geta/吉原下駄 as revellers in the Yaoshiwara Distritc used them on rainy days. -Pokkuri Geta/ぽっくり下駄 worn by maiko, geisha and young girls, generally higher and decorated with golden motifs. -Robou/露卯, Yanagi Geta柳下駄 worn in the early Edo Era. -Uma Geta/馬下駄, square and made of cedar pine wood. “Horse Clogs”, called so because they sound like horse’s hooves on paved streets. -Koma Geta/駒下駄, most common all-weather clogs until before the Meiji Era. -Kiri Geta/桐下駄, high-quality expensive clogs made of paulownia wood. Originally finished with black lacquer. -Odawara Geta/小田原下駄, very popular among harbor workers and fishermen in the 18th Century in spite of their high price. -Ippon Geta/一本下駄 or Tengu Geta/天狗下駄, a clog with only one ha/歯/”tooth”. Both worn by kids and adults. 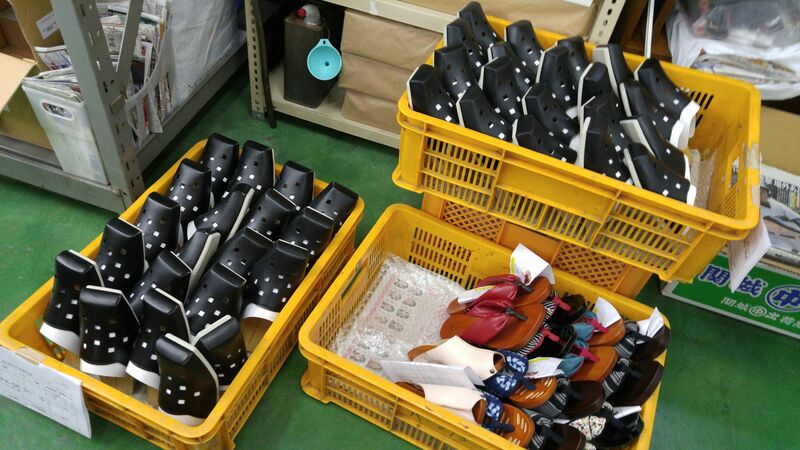 -Bankara/バンカラ/Narrow clogs with high teeth, popular with older time students.